Does ‘relaxed alertness’ sound like an oxymoron to you? For me, this conveys an image of a lion, calmly surveying the surrounding landscape, with just the constant twitch of his tail betraying his immediate readiness. A state of mind that is at once calm and composed, and, at the same time, focused and sharp, ideal for problem-solving, productivity, and composure. Further, this state of mind sheds anxiety. We can achieve this state of mind through meditation and mindfulness practice. We can also facilitate this mindset with L-theanine, or y-glutamyl-ethylamide. 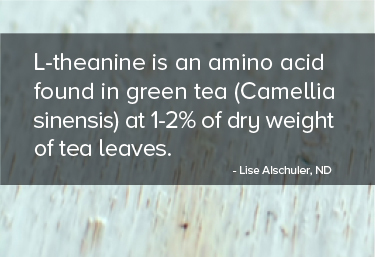 * L-theanine is an amino acid found in green tea (Camellia sinensis) at 1-2% of dry weight of tea leaves. L-theanine is a reliable and effective way to support relaxation and cognitive alertness. * Typical dosing is 200 mg – 400 mg.
Lise Alschuler is a naturopathic doctor with board certification in naturopathic oncology. She graduated from Brown University with an undergraduate degree in medical anthropology and received a doctoral degree in naturopathic medicine from Bastyr University in 1994. Dr. Alschuler is board certified in naturopathic oncology and has been a practicing naturopathic physician since 1994. [no author listed]. L-theanine. Monograph. Altern Med Rev. 2005;10(2):136-8. Lardner AL. Neurobiological effects of the green tea constituent theanine and its potential role in the treatment ... Nutr Neurosci. 2014 Jul;17(4):145-55. Lu K, Gray MA, Oliver C, et al. The acute effects of L-theanine in comparison ... Hum Psychopharmacol. 2004;19(7):457-65. Lyon MR, Kapoor MP, Juneja LR. The effects of L-theanine (Suntheanine) on objective sleep quality in boys with attention deficit hyperactivity disorder (ADHD): a randomized, double-blind, placebo-controlled clinical trial. Altern Med Rev. 2011;16(4):348-54. White DJ, de Klerk S, Woods W, et al. Anti-Stress, Behavioural and Magnetoencephalography Effects of an l-Theanine-Based Nutrient Drink: A Randomised, Double-Blind, Placebo-Controlled, Crossover Trial. Nutrients. 2016 Jan 19;8(1).